An iPad 7 inch? What it would look like | Johns iPhone | iPhone Blog with Help, News, Tutorials, Tricks, Tips, and More! The last couple of months, there has been a lot of chatter about what a smaller 7.85 inch iPad could look like. In addition, this iPad is rumored to be released sometime in 2012. With the large amount of smaller form factor tablets being released, some people think it would be logical for Apple to compete better with the new 7″ Kindle Fire tablet from Amazon. Amazon’s new tablet line seems to be a pretty early success with 3 million sold in the first three weeks. Amazon has called the Fire as its most successful product launch ever. The supply chain has been very specific regarding the actual screen size of the iPad “mini”. 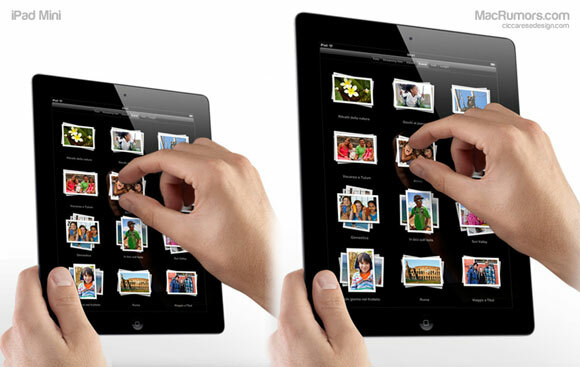 According to many Chinese manufacturers, Apple has been buying many 7.85″ screens for the mini iPad. The people over at CiccareseDesign put together these mockups of what the iPad would look like in comparison to the existing 9.7″ iPad. Simply print the PDF at 100% size on your printer, and you too can see what a 7.85″ iPad feels like in hand. If you don’t have a printer handy, you can view it in actual size in an iPad web browser. If you save it as a web icon on your home screen, it will then launch without a menu bar so you can fully appreciate the size. The 7.85″ iPad actually feels a lot smaller than the existing iPad. The user interface elements, however, don’t feel that far out of place. 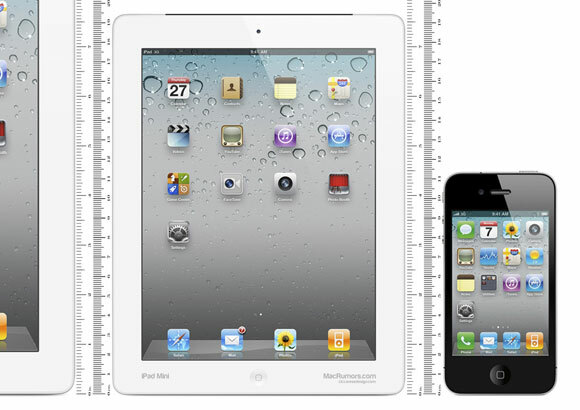 Icons are smaller than the 9.7″ iPad, of course, but still bigger than the icons found on the iPhone. The on screen keyboard also seems quite usable at this size. Other elements, such as Safari’s location bar, do scale down but, again, are no smaller than what we’ve seen on the iPhone. So, based on that stance, it might seem unlikely that Apple would produce such a device, but they’ve been known to change their mind before. So what do you think abou the 7″ iPad? An Apple iPad mini. I can hardly wait! Oh joy. Oh Joy.